Old time store owners and farmers didn't have access to modern sign-making materials. Advertising signs were hand painted on found barn wood and hung with whatever was handy. 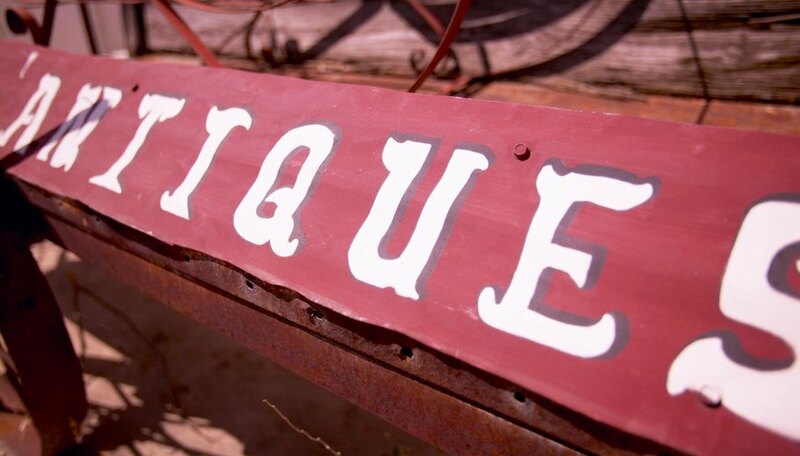 Antique barn wood signs can still be found today at flea markets and antique shops. Old signs are considered artwork and collectors pay quite a bit of money for them. Scrap wood can be distressed and aged to resemble primitive barn wood signs. Even a novice woodworker can create a low-cost vintage-looking sign in little time. Clean the board to remove any dirt. Wash it with a mild soap and water if necessary. Sand the surface with medium-grit sandpaper. Distress the wood by sanding the edges to resemble wear. Poke the awl or screwdriver into the wood in various places to mimic worm holes. Lightly gouge the wood to add an aged look. Make a whitewash mixture by combining one part paint and one part water. Paint the whitewash mixture on the board with the sponge brush. Wipe with a paper towel. Sand and repeat the process until the desired look is achieved. Allow the paint to dry. Choose a saying or other wording to stencil on the board. Dip the stencil brush in paint. Dab off most of the paint on a paper towel. Stencil the letters on the board using a dabbing or swirling motion. Allow the paint to dry. Apply a coat of paste wax to the piece. Drill two holes at the top of the sign. Cut a hanger from medium-gauge wire. Wind the wire around the awl in a few places to create decorative spirals. Feed the ends of the wire through the holes in the board. Secure it in place by cinching the wire ends with round nose pliers. Wood or coffee staining can be used to distress the board. Boards can be hung using saw-tooth hangers. Freehand the lettering if desired.